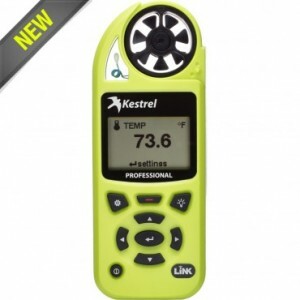 The Kestrel 5200's Evaporation Rate calculator allows you to enter the temperature of your concrete mix (from a probe or IR thermometer), then measure conditions at the pour site. Plus, the Kestrel 5200 allows you to monitor wind-loading on booms and cranes, and even track the heat index on your work site to keep your workers safe. Pair the Kestrel 5200 with the optional Kestrel Vane Mount for hands-free measurements logged over the course of the day. And for maximum functionality, choose the Kestrel 5200 with LiNK to transmit live measurements to your phone or tablet when you're within range. Simply input the duct shape and dimensions and traverse the Kestrel 5200 across the duct. You'll get instantaneous and average volume air flow without the need for any geometry or calculations. The Kestrel 5200 also offers every common measurement of moisture content in air, making life easy to determine dehumidification needs. For ducts that are out of reach, use any extension pole with a ¼x20 threaded mount and Kestrel 5 Series Clip with the Kestrel 5200 with LiNK. This model will wirelessly transmit real-time data to the Kestrel LiNK app for iOS and Android. Delta T allows you to accurately assess acceptable spraying conditions to ensure you're within guidelines and help you select the right spray nozzle. The Kestrel 5200 calculates and logs on-site Delta T without any additional user input. Based upon ambient temperature and dew point, Delta-T provides guidance on the evaporation rate of sprayed chemicals. When combined with the Kestrel 5200's average wind and max wind gust measurements, agriculture professionals can ensure they spray safely, every time. The Kestrel 5200 replaces the Kestrel models 4200 and 4300.